Back in the days when Montreal had 50 inhabitants and was known as fortress Ville-Marie, the existence of today’s megacity seemed to be doomed. The number of French settlers on the Canadian coast steadily decreased due to Iroquois raids and thus, Governor Paul Chomedey de Maisonneuve was left with no other choice than to sail back to France and to promise to return with at least 100 men. Yeah, I was also very surprised to learn about my personal (albeit very distant) connection to the first French Canadians just a few days ago. But let me start right from the beginning. Although I prefer autosomal DNA testing to all other type of tests (due to my primary interest in family relationships over the past 200 years), this year I could not resist FTDNA’s summer sale on a mtDNA full sequence test. Thanks to 23andme and LivingDNA, I already knew that I belonged to haplogroup T1. However, for a more detailed information, as well as a list of DNA matches on your direct maternal line, you need to order an mtDNA test from FTDNA. A full sequence test of one’s mitochondrial DNA means to encode all 16569 base pairs and to compare the results with all other individuals in the database. Mitochondrial DNA, or mtDNA for short, accounts for only about one percent of the total DNA and has been passed down from mothers to children for thousands of years, but carried on to the next generation only by daughters. Now and then – this term can span hundreds or thousands of years – DNA replication results in a mutation, which is nothing other than a copying error which is then passed on to the following generations. When any two individuals are compared, a smaller number of mutations in their mtDNA indicates a closer relationship. As the mutations are extremely rare, it is thus possible to look much further back in time than with autosomal DNA. Due to the specific mutations in their mtDNA, all humans can be assigned into different mitochondrial haplogroups. As some of the haplogroups are older than others, a tree with many branches emerges, all of which are leading to the most distant ancestor on the direct maternal line of all humans living today – the mitochondrial Eve. Some haplogroups are typical for certain regions, which allows to draw conclusions about human migration. The more detailed analysis of mitochondrial DNA by FTDNA reveals not only which particular haplogroup you belong to, but also the names of all individuals in the database with the same maternal lineage. Since there are also differences within a haplogroup, DNA matches are presented in “genetic distances”. A genetic distance of 1 means that mtDNA of two individuals differs only by a single mutation in the 16569 base pairs. Matches with a genetic distance of 4 or more are not displayed in the database. With the help of church records and censuses, I was able to trace my direct maternal line to one of the first settlers on the Volga – my great-great-great-great-great-greatgrandmother Katharina Neckermann from Mainz, born in 1735. Unfortunately, I was not yet able to continue her line in Germany – as of now, there is only a single trace leading to Königshofen. When my mtDNA results came back at the beginning of October, I learned that I belonged to the T1a haplogroup, a subgroup of T1. The first thing that struck me was that the direct maternal ancestors of my “closest” matches were all French. And second, that two of the matches, Michel and Daniel, seemed to have traced their maternal lines back to the same woman or family respectively. After comparing their pedigrees, I was astonished to discover that Michel and Daniel were 9C1R! Thus, it was very likely that they did not know each other before and worked on their pedigrees separately. And the DNA test confirmed their research in a truly wonderful way! The direct female ancestors of four of my matches all go back to the same woman – Marie Bruyère dit Brière, born 1604 in France. The source about her daughter Marie Lorgueil had mentioned something about “La Grande Recrue” and caught my interest. After a few clicks on Google, I suddenly found myself in the midst of Canadian founding history. 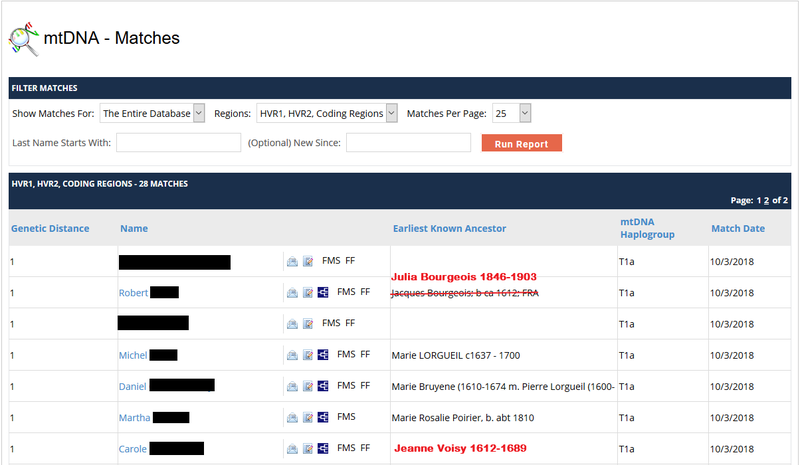 Marie Lorgueil was one of the first women to leave France for a new life in Canada and became the female line ancestor of hundreds of thousands of French Canadians, four of them turning up on my mtDNA match list. How fascinating! And what about Carole and me? Our lines are not incorrect; even though we are not descended from Marie Lorgueil like the others, we have a common female ancestor with her, who we still need to look for further back. Most likely in France. Most certainly more than 400 years ago. 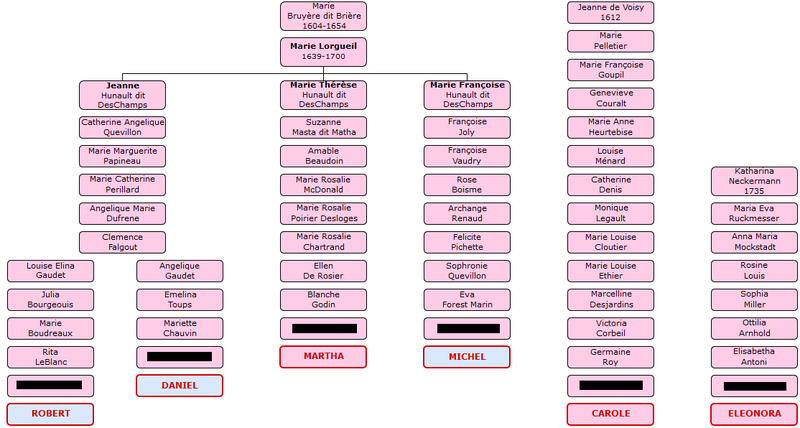 The fact that four descendants of three different daughters of Marie Lorgueil are a genetic match to each other is a very strong evidence for the accuracy of the paper research. Since the testees are very distant cousins, an autosomal test would not have been very useful in this case. There would be a small possibility for an autosomal match between Robert and Daniel, but not with the others. Herein lies the biggest advantage of an mtDNA test for genealogists – to confirm or reject theories of a more distant relationship on the direct maternal line. For example, to confirm my descent from Katharina Neckermann, I have to find someone for an mtDNA test who is descended from her other daughter, Elisabeth Ruckmesser. This has already been done for a long time with historical personalities. Philip Mountbatten, the consort of Queen Elizabeth II of England, was a key figure in the identification of the remains of the Russian imperial family found in 1997. Czarina Alexandra was the sister of his maternal grandmother, Victoria of Hesse-Darmstadt. (Their maternal grandmother was none other than Queen Victoria.) Likewise the bones of Richard III (1452-1485) found under a parking lot in Leicester in 2012 were confirmed by an mtDNA test of his living relatives, descendants of his sister Anne of York. History in itself can be personalized in a certain way by taking an mtDNA test (the same applies for a Y-DNA test). In our history lessons we learn the names of many significant people without ever thinking that these people could have been our distant relatives or ancestors. According to the calculation of the mathematician Joseph Chang in 1999, every European today has a common ancestor who lived around 1400. Therefore, when we research our family tree further back, our ancestors stop doubling with every generation at some point. The ancestors become fewer again, because sooner or later some people begin to turn up several times in our pedigree – because there were fewer people back then than there are today. So the question is not whether you are related to an important historical person, but to whom. Petrarch, Marie Antoinette or Abraham Lincoln? Their mtDNA haplogroups and the ones of many other famous names are known today. How about a DNA test? Continue reading "What do one of the first settlers of Montreal and I have in common"
Continue reading "An example of endogamy in my family"
Continue reading "Visual Phasing of Chromosome 1 – updated version using Steven Fox’s Excel spreadsheet"
Continue reading "Visual Phasing of Chromosome 1"